I'm not big into fan fic, but listening to the RotJ soundtrack the other day I was inspired to write something based on the battle of Endor, and of course I had to write it from the point of view of Wes Janson! Wes watched the surreal swirling of hyperspace go past his X-Wing viewport. a small counter on his command console counted down to normal space. "What the Hoth was normal anyways? ", he muttered to himself. During this war he saw way too much to even remember what is was like. A small beep brought his attention into sharp focus. The swirls turned into streaks, and finally into pin points. All around him several dozen other fighters appeared as they arrived at their destination. A destination he knew few will survive. The partially completed Death Star hung above the green moon like some kind of monstrosity. So out of place, and even unfinished, it looked extremely lethal. Wes started to prep his fighter. Shields full, double front. Targeting computer on, scanning for pre-determined targets, S-Foils swung into attack position as he cranked the engines of his T-65 to full speed. "Look at the size of that thing! ", he thought to himself, and quickly made a note to make sure Wedge never found out. R2-DX, his garishly painted astro-droid, beeped a warning. Looking down at the trans screen he saw a question he didn't like. Where is the Death Star shield status? Almost immediately the same question could be heard on the command channels. Admiral Ackbar and General Calrissian deciding that hurtling at full speed towards a battle station is a good time to argue. "It's a trap!" Ackbar declared to the fleet. Wes pulled back hard on the stick and watched an A-Wing disintegrate against the unseen shield. He didn't have enough time to wonder who it was. His console was lit up like a Wookiee's birthday cake. "What the? ", he thought it was a malfunction. There was no way that many targets were out there. Then he saw them. The sky was full of Imperial hardware all aimed, it seemed, at him. He pulled the X-Wing into a sharp twisting manoeuvre that cleanly avoided the first of the enemy lasers lancing out towards him and lined up a squint in his guns. One down. Several thousand to go. "Hobbie! Who invited all these people to our party? ", Janson called out to his squadron mate. "Darn if I know Wes, but look at this way; plenty to shoot at! ", Derek replied back. His voice was not quite as jovial as his comments. Wes knew from experience that Hobbie was already working six shots ahead. Wes aimed his fighter straight at a cloud of dupes. A dupe is pilot slang for bombers because of their double hull design. Those bombers would only be there for one reason; to take out the capital ships behind the fighters. Ships he knew he had to protect at all costs. Three more shots. Three more kills. 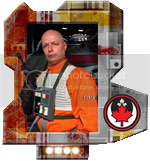 Whatever some members of Rogue Squadron might think of Wes the person, they all knew he was the best shot, and relied on his ability to clear out a gap in any attacking force. Well... second best shot, compared to Luke Skywalker. "Where is Luke when we need him? ", he thought, as he slapped shields to full coverage, throttled down to one-third speed, and performed a twist sideways and down and fired into empty space. A space that less than a second later was taken up by three more bombers who seemingly walked into Wes's shots. "I guess I have to do everything. Again!". Already though, Wes upped his speed to full, doing a barrel roll and aimed himself toward the next flight of targets. "Janson, Hobbie, grab your wingmen and follow me! ", it was Commander Wedge Antilles, with Luke away, he was in charge of the Rogues. "We need to protect the medical frigate!". Wes looked to his left, Rogue 11 was gone. A quick glance at the console confirmed it. Taken out by an interceptor in that last wave. Rogue 12 came up quickly on his right. "You heard the boss, let's go." Janson rolled in a big loop and headed toward the frigate. Already he could spot the squished looking profiles of TIE interceptors on his targeting computer. No wonder why they called them squints. "Dex, get me a fix on that group. ", Wes asked his astromech as he brought up the missile targeting screen. A slow whine increased as the computers locked onto the first target. With an insistent beeping noise coming from the speaker, Wes fired the first missile. Immediately he started to track the next target. Locked in. Fire. Before Wes could aim for the third target though a more pressing concern grabbed his attention. A TIE fighter was coming up behind him and quick. Wes slowed down too much to get a better lock and now was in range of the pursuing fighter. "He wants to get closer? OK, I'll give him closer! ", Wes slammed his shields to full strength behind, set the engines to dead stop and hit full braking. The unshielded TIE flew straight into the suddenly stopped X-Wing and blew apart in three pieces. Alarms rung in Wes's cockpit. That manoeuvre is not recommended, but it works in a pinch, the T-65 shields can take quite a lot of damage before they fail, and a TIE fighter can't. "Dex, can you fix the anti-grav?" Everything else on his ship was drained but undamaged apart from the anti-grav. Wes liked to have it set a bit lighter than normal so he could do some of his acrobatics, but not set to zero. Dex indicated it should be fixed in a few minutes, as Wes gunned the engines forward to the rest of Rogue Squadron, already at the medical frigate. There was a lot of debris near the frigate. B-Wings mostly. They were supposed to be protecting this ship, but like so many on this day, were caught off guard. Wes figured several hundred people were already dead. It had been only ten minutes since they left hyperspace. How many more minutes before he joins the list he wonders. That is it so far. Looking for comments, criticisms, etc. Should I continue the story? I liked that. Let's hear some more. Tell us a story about the old days before the New Republic Unca' Wes! "Well kids, did I ever tell you about the time I saved Bacon Splat's hide when we were in the Tanaab Yellow Aces?" Thanks for the comments so far! I need to re-watch the battle to make sure I get the next set of events in order. Wouldn't want a continuity error or people will think I made it all up! So when can we expect the next installment? I will bake some wookiee cookies and bring the blue milk for the next chapter.